A few weeks ago, I wrote about a fantastic demonstration of Victorian-era photography processes that I got to see at the People's History Museum. 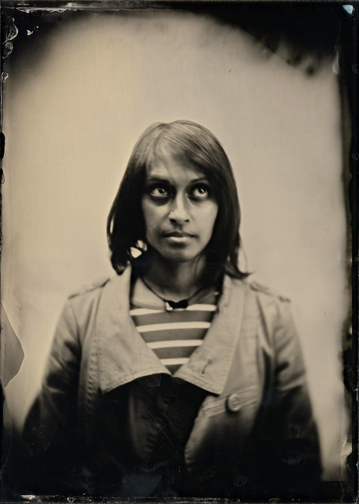 Tony Richards is the photographer, and he loves old-time wet-plate processes. I was very fortunate to be the sitter for the portrait demonstration, and after developing the glass plate, painting the back black and varnishing it, Tony gave me the portrait! It makes me look so dark, almost dirty! Fascinating process, though, and it's a treasured keepsake for me! You look so...dirty. And old. Did you manage to frame it? If its a problem just pop into the studio and I'll do it for you. I haven't had a moment yet, but I'll come visit you soon!